07 16 The complimentary supper given by Mr. E. R. Robinson, the proprietor of this new public house, came off according to appointment on the 15th. It was generally attended . . . all passed the evening delightfully in the enjoyment of the special hospitalities of the occasion. There were seats for about one hundred and fifty guests and we do no more than justice when we say that no more sumptuous table was ever prepared in this city. The “bill of fare” comprised everything in the way of fish and fowl and all varieties of the choicest delicacies. Oysters in the shell were served up in every style the ingenuity of experienced cooks could devise, meats of all descriptions were furnished in abundance – in short, nothing was wanting that could satisfy the taste or please the fancy. The gay assemblage was in the best of spirits and all passed off charmingly. It has never before been our fortune to see so many of our citizens together at a similar festivity and all departed with the highest appreciation of the courtesy and liberality of the new landlord. The Robinson House of this city is now fully opened to the public and a better arranged, better furnished and better kept hotel is nowhere to be found. The guests of Mr. Robinson feel themselves at home. Several families have already abandoned housekeeping and taken rooms at the Robinson and we understand more contemplate doing so. No speeches were made or toasts drank at the party we have spoken of, but if we had been called on for a sentiment, we should have been prompted to offer something like the following: The Robinson House – May its Union flag wave in the breeze and its proprietor meet with the full success and generous reward he so richly deserves. Mr. James Kilmer, formerly of the Watertown House, has recently become clerk of the Robinson House of this city, one of the best hotels in the state. Mr. Kilmer is one of those intelligent and genial gentlemen that friends and guests always like to meet. Attentive and accommodating, treating all alike with courtesy and urbanity, he will be sure to win the respect and good will of all who have business to transact with him. This being Leap Year, the ladies have asserted their privilege and got up an old fashioned sleigh ride and it is to come off tomorrow . 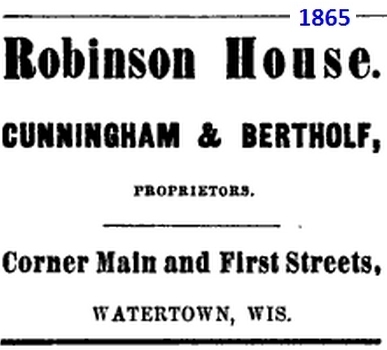 . .
We learn that Mr. R. E. Robinson, the proprietor of the extensive and popular hotel known as the Robinson House, has sold that establishment to Mr. Peter Bertholf and Benjamin Cunningham of this city for $8,000. The new owners will take possession on the 1st of April next and no doubt maintain the fair reputation of the house. Tomorrow the new proprietors of the Robinson House, Messrs. [Peter] Bertholf & Cunningham, take possession of their establishment and Mr. Robinson, who has conducted it with so much ability and success during the past year, retires. It is now one of the best hotels in the state and enjoys a reputation it is well worth while to keep and which we have no doubt will be maintained by the new proprietors. Eugene Gebhardt: Barber rooms under the Robinson House, on First Street. Shaving, hair dressing and champooing [shampooing] done with neatness and dispatch. 1911 ROBINSON HOUSE BAR / Pictures of Days Gone By.